Dr. Erik L. Jennings Simões is a neurosurgeon who works deep in Brazil’s Amazon rainforest. He founded the first public service neurosurgery unit in the interior of the Brailizian Amazon and became a private pilot to reach it. He will share both his personal experiences in the rainforest as well as the ethical, cultural, logistical and other aspects of providing health care to recently-contacted populations. For more than 18 years, Jennings Simões has operated on patients with specific neurological diseases contracted in the forest, such as intracranial hematoma caused by snake bites, head trauma from falling hedgehog nuts and accidents involving encounters with trees and wildlife. Along with frequent visits to the interior, he was appointed health coordinator of the Zoé people, an indigenous recently-contacted tribe. 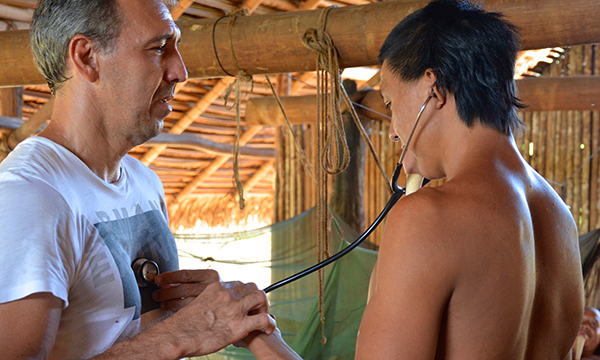 Jennings Simões divides his time between the neurological service of the municipal hospital of the city of Santarém and a small hospital in the middle of the forest, under his direction, where he cares for the indigenous Zoé people. He often uses his own single-engine airplane to reach the site. Some of Jennings Simões activities have been presented in public television documentaries. Others include investigations into the forensic use of necrophagous fish from the Amazon. Jennings Simões is also an environmental activist and defender of the rights and culture of indigenous peoples. He is currently a consultant to the Ministry of Health for health matters involving isolated indigenous peoples of recent contact. This governmental ministry advocates for cultural, environmental and social preservation as the major provider of health care for these peoples. In addition, he coordinates the medical residency program in neurosurgery at the State University of Pará.